Happy Weekend to you all!! We are going to a graduation party in 2 hours and I just finished the card! Kaitlyn is my son's girlfriend of 3 years and she is moving with him to Florida. She is a straight A student and will attend college for Veterinary Technician and then maybe go on from there. 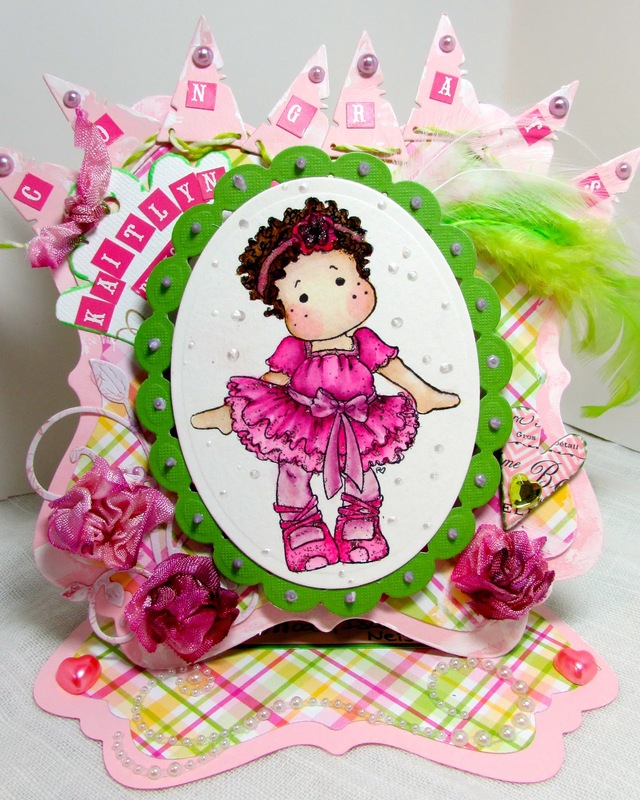 I made her a Easel card with prima pearl swirls holding it up while it is open. The banner reads CONGRATS on a Magnolia Doohickey banner die. I edged the banners with white paint and then used Tiny Text by Cosmo Cricket letters and lavender pearls. A Magnolia Doohickey tag die is under the banner with her name on it and Fabulous. I made my own flowers from seam binding. They are dyed Picked Raspberry and Seedless Preserve Distressed Inks and then I crumpled them into a flower to let it dry. Carefully picking them up and placing them onto a taped circle to adhere them. Only one unraveled so it is part of the tag. Tilda is colored in DI picked raspberry and seedless preserve, skin is vintage photo and tea dye. Her hair is vintage photo and a copic multiliner pen. Liquid pearls in white surround her while I used lilac on the green frame around her. Closeup of the bottom of the easel and the handmade ribbon flowers. The green and white feathers are fun and whimsical for her. Miss Tilda wobbles!! She is dancing and celebrating her graduation in style. Here is a closeup of the wobble mechanism. I hope you are having a very nice weekend, my heart goes out to everyone in the stormy weather. I wish it wasn't so violent. I have a long prayer list going! Thank you for leaving comments, I really appreciate them and I will be catching up with all you shortly as long as the internet is working, wow did I miss my internet!! WOW! Spectacular. I love all the pink. You were very creative with all the dies. Great design. I am sure she will treasure it. Adorable, Kelly. Love how you put a wobble on her and the Congrats message at the top using pennants. Very creative. It looks like a crown. 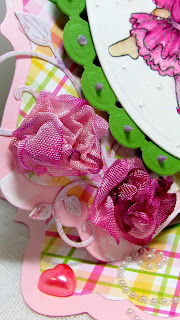 I love those ribbon flowers it gives your card so much texture and interest. Gorgeous creation. Very pretty! Kelly! Kaitlyn will appreciate for sure! love the wonderful shades of pink, and the pretty tilda. Hugs. Incredible details and the best flourishes and WOW, love that you color with DI's. I have to agree with Lisa....a wonderful, expert display of pictures! Very impressive and I am in awe over the wobble mechanism...well done, my friend! I'm sure she will treasure this work of art forever! I really love the pennants as well...outstanding design work and coloring, Kelly! Gorgeous, Kelly. Love the shape of your card. The vivid colours are gorgeous. The banner to spell out Kaitlyn's name looks terrific. I'm sure she will love this. 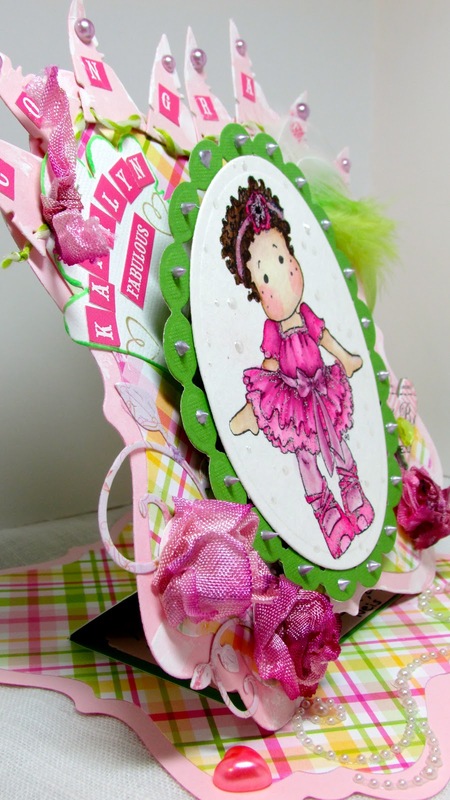 Oh Kelly you have created a delightful easel card. Lovely colors and I have my eyes on those bias flowers. You sure are clever!!! Kaitlyn should treasure this beauty!!! So beautiful! She will love it!! 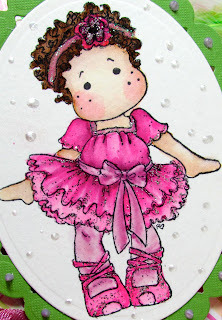 What a wonderful job you did making Tilda dance in addition to all the fabulous details on the card. Great Job!! Hey Sugar - now I know why you have been cooking, cooking, cooking. How did everything turn out? When are the kids going to Florida? Will you be taking them down? Know where they willbe in Florida? Don't you have another son moving to Florida too? It is so hard to keep up! Kaitlyn's graduation card is wonderful and I know she will treasure it. Anyone would!! OMG , Love your shaped Card with these stunnin pink tone,,,,,,,and your coloring is amazing,,,,,,,Thanks for your cooments at May' s Happy Daze ,,,,blog,,, May wa working with my colorful Birds,, feel free to visit my store and choose your favorite product for free,,,, e-mail me to nicecrane@yahoo.com. Hope you had a great time at the graduation - what a fabulous card! Super cuteness! 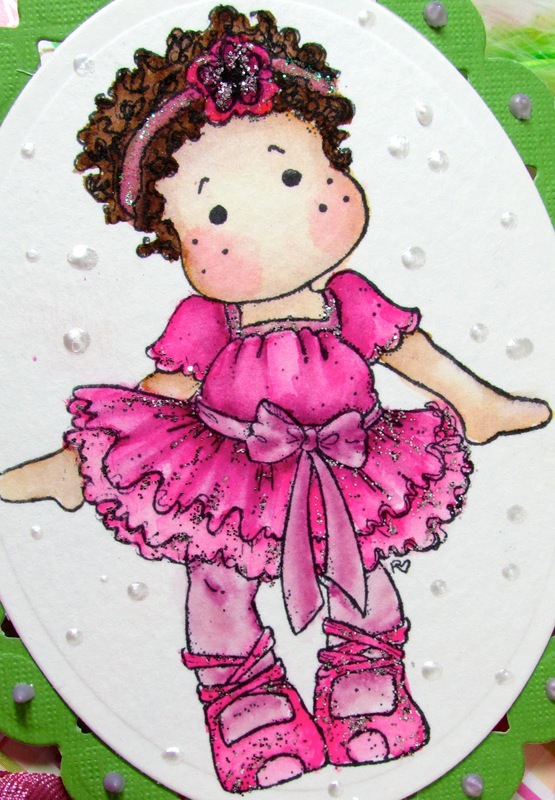 Loving that sweet tutu! Thank you so much for playing along with us over at the Simon Says Stamp Challenge blog! Oh what a lovely card this is and i love all the details so much to see. Thanks for joing us at IAMC. This is just darling!!!! I love all the pink, I love the way you made the "wobble", she will love it!!! My granddaughters name is also Kaitlyn, isn't that just the cutest name?? LOL! Gorgeous as always Kelly. Fabulous easelcard and I love your colorchoice. So beautiful Kelly, Love the vibrant colors, the shape, well....love everything about it! And thanks for sharing with us @ Tilda'sTown challenge this week! Wow this is a stunning card with a stunning project. I love the colours and the emebllishments. Great job. Such a sweetie-pie image and coloured beautifully. I love those binding flowers, very creative and nifty!